Signing for ADA Compliance - Dornbos Sign & Safety Inc.
Have you ever felt like it was time for some new parking lot signage to keep people from parking in handicap spots? 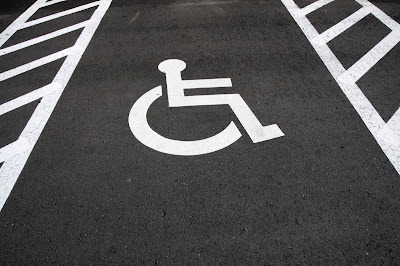 Without the proper signage, many people simply park in handicap spots without noticing them. An easy solution to resolve this is to order a highly visible handicap sign. 3M High Intensity Prismatic Reflective Sheeting. High Intensity 3M prismatic grade for better visibility at night, in stormy weather and in areas with competing lights. Durable design, as each sign is constructed using rust-free, heavy gauge durable aluminum. Guarantee from 3M for at least 10 years which includes a no-fade service. Signs with holes drilled at top and bottom center for easy mounting. The exciting news about using the proper signage is that they actually work. Handicap signs will deter people from parking in designated handicap spots. With vibrant prismatic sheeting and high quality ink from 3M, it’s hard for anyone to miss these signs! Need to get this sign up quickly? Not a problem. Every handicap sign from Dornbos Signs comes pre-drilled with mounting holes. This feature makes installation a breeze. Using 3M technology, this sign is built to last for 10 years without fading. In addition, each sign is built to reduce glares from the sun or oncoming traffic, withstand difficult weather conditions and comes backed by a 3M guarantee. For over 60 years Dornbos Sign Inc. has provided security and traffic control signage to customers around the country. With unmatched products and customer service, you can rest assured that you are making a great purchase when shopping with Dornbos Signs. These outdoor signs can be purchased and delivered to any residence or business with free shipping available on select orders over $99.